Here’s another great coldwave release from the 1990s. Technically, this band hails from Switzerland, but employ the French coldwave sound of the 80s and early 90s so very well that they almost had me fooled, mostly because of all the French titles and references. Highly recommended for fans of Gestalt, Résistance, Mémoires D’automne, Lucie Cries, etc. Expect some more synthy/club oriented things to follow over the next few weeks! 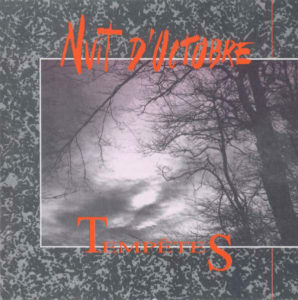 This entry was posted on June 15, 2011 at 4:49 pm and is filed under 1990s, 1992, coldwave, goth, nuit d'octobre, post-punk, swiss, switzerland . You can follow any responses to this entry through the RSS 2.0 feed You can leave a response, or trackback from your own site. Long live the Cold Wave!